Don't get me wrong...I love my razors, but row after row of razors on a shelf eventually leave me a bit cold. In all of the years I have been in the antiques and Barberania business, I have never seen anything like this item. After an extensive search, I have concluded that there are none like it surviving in the world that are known to exist. 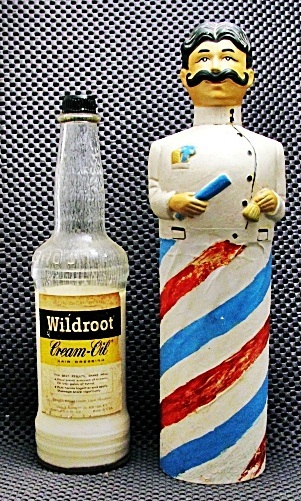 This unique item is a decorative bottle cover which fits snugly over an early 1950s era Wildroot Hair Cream bottle. It may fit earlier bottles if they were exactly the same side. 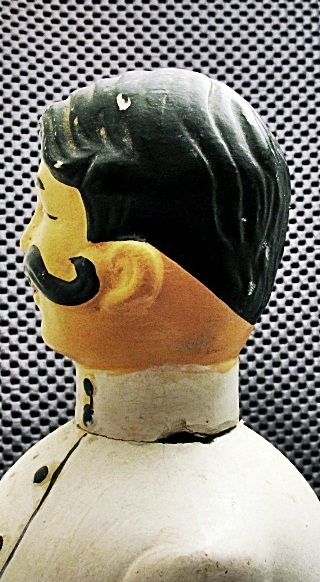 The "Barber Pole" part of the piece is a cardboard tube covered with paper that has been handpainted. This tube travels up to the waist where it meets a Plaster of Paris figure of a barber. 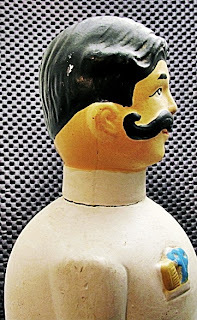 The figure is hand-painted and calls to mind the barber of the Gay 90's holding a straight razor. Overall, the painted surfaces are in excellent condition, with a few lost chips on the hair. As it was the weakest point of the piece, the neck was broken off but was carefully glued back into place. No plaster or epoxy was added in an attempt to disguise the break line, but it is so small that it does not detract from the beauty of this piece. The piece is 12" tall. Why did almost none of these survive? Being made of cardboard and plaster, these bottle sleeves were very prone to damage by water and breakage. Also, since they only fit specific Wildroot Cream Oil bottles, once the bottle size changed, there was no need for the cover. Additionally, once the head broke off, the cap could no longer be turned and, once you lifted the sleeve, the head would tumble to the ground. Bar none, this is the rarest barbers item I have ever owned. And if you are looking to build a truly exceptional collection, it is these types of items you should be seeking.